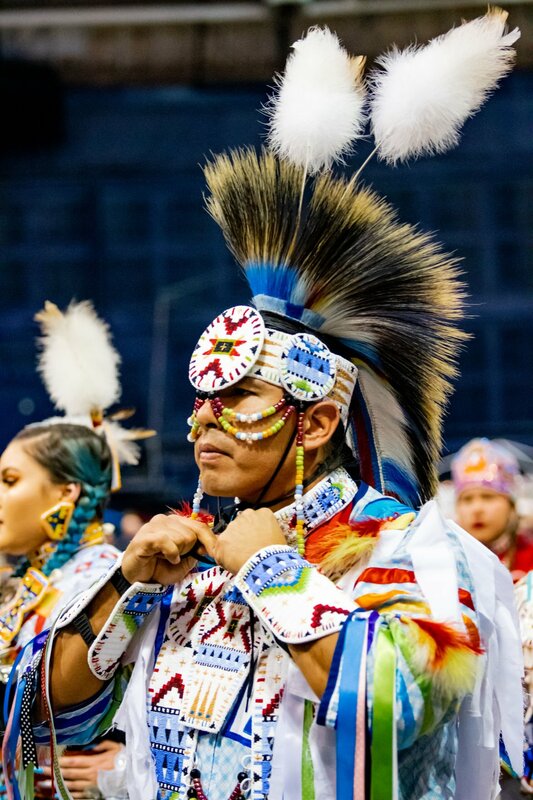 A man dances during the round dance at MSU's 44th annual American Indian Council Powwow at Brick Breeden Fieldhouse on Friday, Mar. 29. Photo by Amy Lynn Nelson. Miss Indian MSU dances during the round dance at MSU's 44th annual American Indian Council Powwow at Brick Breeden Fieldhouse on Friday, Mar. 29. Photo by Amy Lynn Nelson. A young girl and her mother walk during the round dance at MSU's 44th annual American Indian Council Powwow at Brick Breeden Fieldhouse on Friday, Mar. 29. Photo by Amy Lynn Nelson. A woman dances during the round dance at MSU's 44th annual American Indian Council Powwow at Brick Breeden Fieldhouse on Friday, Mar. 29. Photo by Amy Lynn Nelson. Montana tribal members participate in a drum performance during MSU's 44th annual American Indian Council Powwow at Brick Breeden Fieldhouse on Friday, Mar. 29. Photo by Amy Lynn Nelson. Montana tribal members participate in the round dance during MSU's 44th annual American Indian Council Powwow at Brick Breeden Fieldhouse on Friday, Mar. 29. Photo by Amy Lynn Nelson. A young boy dances during MSU's 44th annual American Indian Council Powwow at Brick Breeden Fieldhouse on Friday, Mar. 29. Photo by Amy Lynn Nelson.